Harmony Road Studio: Final Christmas preparations..including burnt glue? Final Christmas preparations..including burnt glue? Well I finally got the end of my shopping done. For some reason I had to call in a prescript in before the weekend as I knew chances were the stores would be closed and I would be left hanging. So I trek into town yesterday...what a madhouse. I am finished my shopping, groceries included and I am so glad to be done. My car just sits dead in the driveway but the truck has been taking me hither and yon on speedy trips and doing the necessary tasks during this season. Thank goodness for the 2nd vehicle. Anyways I got the wrapping done today, and I decided to make the neighbours cards as well. We don't exchange gifts but we always give cards to one another. Every year I make them, this year I am running a bit late in that dept but today was a good day to play catch up. I am really excited to show you a brand new technique that I will be playing with a lot this year in my art. I found this tutorial on the Michael's website using burnt brown paper bag butterflies. Well butterflies are always somehow incorporated into most of my art except Christmas but I tried these first then expanded. 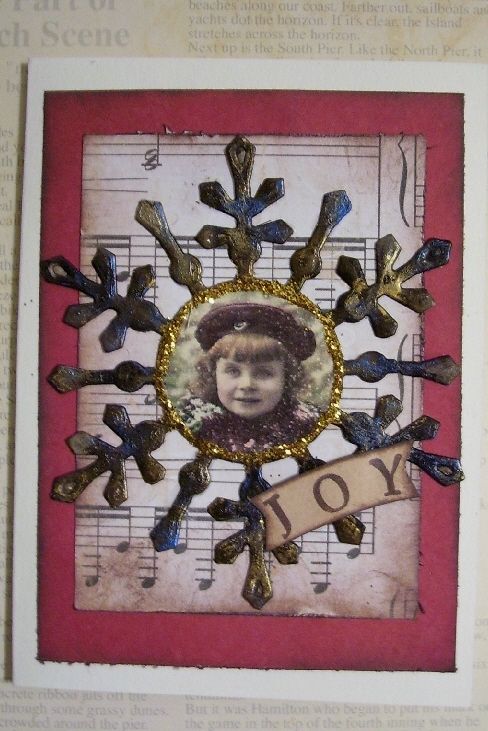 I did a few things differently and I will explain as I show you what I first made then progress to my greeting cards. Here is the video in case you have never burned glue before. Of course the preferred product for the video is Aleene's tacky glue. I did do that in the beginning and I didn't use brown paper bag, I used brown craft card stock paper, since it had a good durability to it. 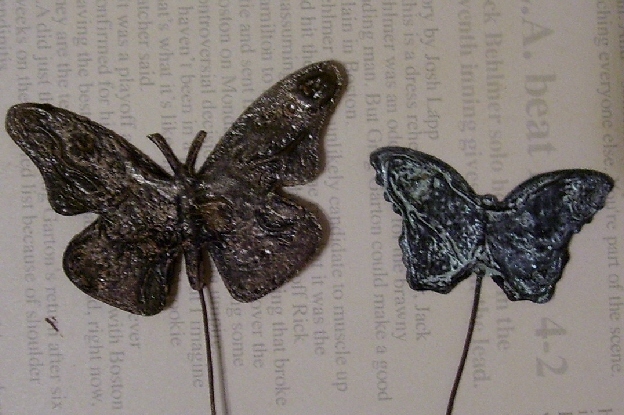 I cut 2 die cut butterflies for each and applied the wire as shown in video. I did everything else as instructed. 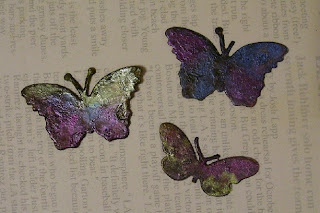 When it was cooled I took the black soot off then I applied shimmery chalks to the butterflies. I liked it but it really wasn't exactly what I wanted to achieve. Although I liked the texture of the burnt glue but I really wanted a more vibrant colour. So the next time I tried it I did the same without the wire and I tried just plain white glue to see what the difference is....well not much but after the butterflies cooled and wiped, I applied Twinkling H2O's with a bit of water and rubbed the colours here and there with my fingers and blended the colours. Wow that is what I was looking for. This technique really does give the illusion of faux metal. Even the paper feels very sturdy. As you can see I burnt a few antennae but that is because I probably didn't have enough glue on them. You need to cover the paper and not glob it on but a good smooth coat. The more glue you use the longer it takes and it does bubble up and I basically put the paper right into the flame. I know it says you don't need to but I did and no flames appeared. The glue is not flammable. Even the cheaper white glue. If you do get a flame, be quick and blow it out, you didn't have enough glue in that spot. So here are the butterflies with the Twinkling H20's. 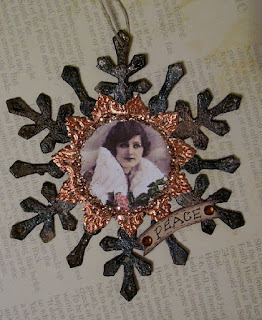 So then I wanted to make a few ornaments to put on gifts and I thought well I want to try my Spellbinders snowflake. I again cut two, this time out of recycled cereal box, glued the 2 pieces together. then I applied glue to the brown side, glue the advertising so just the brown is on the outside of the flakes. Do the technique, wipe soot with Kleenex. I do not recommend a baby wipe, it makes it too wet!!! been there tried that, don't do it. If you click on the image you can get a good close up of the surface of the snowflakes...cool huh? looks like real metal. I believe on this snowflake I rubbed the metallic chalks in a bronze and green to give a patina look. 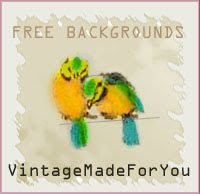 I then edited an image, this one is from Gecko Gals collage sheet I won. 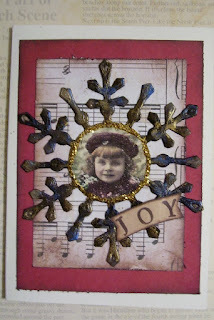 Cut some bronze German Scrap from Artchix and placed around the image before I glued it to the center. Added bronze glitter, at the time I thought it was gold but the lighting was throwing me off. Then I added a little banner and glued it on. Couldn't find any bronze ribbon so I just used a piece of jewelry hemp. That was it. Then I made Christmas cards except I put Twinklings on the snowflakes in a really thick consistency and just dabbed it on with my fingers. I had lovely bright pinks and blues and gold on my fingers, so lovely getting my hands right in there. I believe I got the image from Magic Moonlight images. I just love this child and the snowflakes that show up in the image. Well I know everyone is busy with company, last minute baking, wrapping and cleaning before the big day. 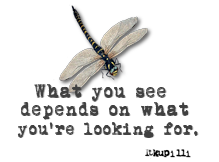 I thank everyone who has been kind enough to visit, those who do so regularly and my new friends. I wish you all a very Merry Christmas and a Wonderful New Year. With much Joy and Blessings to you all. Oh gosh, I haven't even begun wrapping! lol I have been so busy! Sending hugs your way and wishing you a very Merry Christmas!!! and a Happy New Year ahead! P.S. I LOVE what you made--it's all so beautiful!!! oh Les i have been dying to try this technique , how cool teh twinklings worked, i love them when they are goopy.... love what you and good that had teh 2md car..
looks like you had a great time playing! I've never tried this technique, it looks awsome! GORGEOUS!! Thanks for sharing! Merry Christmas! Just beautiful Les.. looks like alot of fun.. Wishing you a wonderful Christmas and New year too..
Merry Christmas to you and your family from a very HOT Cape Town! Thanks for all your comments and help and swaps over the past year. I have really enjoyed your friendship.